Journeying from Russia to England, and places in between, international travel brings unique life experiences. Mykonos, Greece, is a 33-square-mile island in the Agaean Sea. 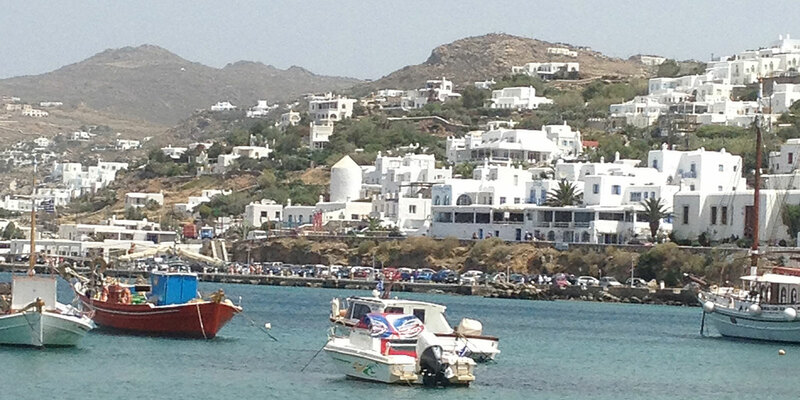 Nicknamed the “Island of the winds,” Mykonos is home to 10,000 inhabitants. Wanderlust, a strong desire to travel the world. Throughout a person’s lifetime there are opportunities to travel to new places for many life-changing experiences. Taking time out of everyday life to submerge in another culture can offer travelers a whole new outlook on life. Some trips can make you appreciate the life you have or can give you inspiration for new life goals. Every trip I have ever been on has influenced my life in some way. It makes you feel like you’ve lived a whole different life, you feel unstoppable. Traveling makes you feel sophisticated, even educated. While in Honfleur, France, I was sitting outside at a cafe with my sister and a few other people and we successfully ordered a whole meal speaking French. It made us feel like we actually knew some French and we even applied it to a real life experience. Even just being able to say that you’ve been to Paris or London, just makes you that much more interesting. I always list traveling as a hobby or something I like to do. One question I always get is where have you been, and when I start listing the places I’ve been people start paying more attention to what I am saying. While traveling you tend to want to try anything, you try food you would have never thought of, along with many other things. I’m not a picky eater at all, so traveling and finding food to eat has never been a problem for me, plus, I like to try new things. One thing I have tried is Russian coffee, which is more like a giant cup of espresso. Also while in Russia, I tried borscht, which is a Russian traditional dish of beet soup, and I actually enjoyed it. Since I’ve been back from Russia I keep trying different recipes but none of them tastes nearly as good as the soup I had in Russia. My rule is when traveling you have to try the foods that are staples to that country, and I haven’t been disappointed yet. But most importantly traveling shows you how others live. One of the first places I traveled to outside of the U.S. was Krasnoyarsk, Russia, five years ago. I remember when I stepped off the plane, it felt like I was in a whole different world. I had no idea what anyone was saying to me, I didn’t understand any of the signs. I had never felt so lost. At one point during the trip I started packing my suitcase, telling my mom that I was getting on a plane and flying home. After spending a month in Krasnoyarsk, I began to feel more and more comfortable. From that point on, each time I traveled outside of the U.S., I felt more comfortable. Going overseas the summer before my freshman year of high school gave me a new outlook on how to be thankful for the life I have. My family had decided to adopt a little 2-year-old boy named Andrey. One of the hardest things I’ve ever had to go through happened in Achinsk, Russia. While I was standing outside the orphanage, a little girl with bright blue eyes came up to me and asked if I would take her home and love her. I felt so heartbroken. So far in my travels, I have been to Russia, France, England, Italy, Croatia, Greece, Mexico and Turkey. One of the most unique experiences about traveling outside of the U.S. is standing in places that are rich in history. I remember standing in the middle of the Tower of London, thinking how amazing that so many historical figures like Henry VIII and Anne Boleyn had walked where I was. The U.S. is so young compared to many other countries. In Ephesus, Turkey, I was walking around on the ruins and looking at the The Library of Celsus. It was an eerie feeling to be standing somewhere so old and that has been through so much. Each experience, from traveling from the middle of Siberia, to standing on the beaches in Greece, to ordering a meal in French, has given me so much, making me the person who I am today. I’ve caught the travel bug and just don’t know how to stop traveling now. I plan on traveling to many more places throughout my life. I’m thinking maybe Germany or Ireland will be next. Hannah Ballard is a staff journalist for MBU Timeline. Ballard is a junior communications studies major. She is a member of the cheerleading team. Ballard loves to travel internationally and cook. So far her favorite country to eat and visit is France. After graduation, Ballard plans to go to law school.